In the Victorian period, men rarely went out without a hat. It was possible to establish a man’s social status by the hat that he was wearing, the wealthy wore top hats made from black silk and a working man wore flat caps, appropriate for work. 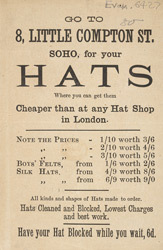 Blocking, a procedure featured in this leaflet helps to give hats their final shape as the material is stretched and pressed onto a shaped wooden block. If a hat lost its shape or had been crushed it could be pressed back into shape at milliners like this one.